Portland, Oregon is one of those cities that features old town charm with a hip and vibrant culture. Nestled within the “old town” section of Portland lies a gem that for doughnut connoisseurs is the epitome of good eatin’: Voodoo Doughnuts. We knew we had arrived at the right place when we saw people walking away with Voodoo’s famous pink boxes. We also thought we had arrived at the entrance early but were greeted with a line that literally wrapped itself around the building. 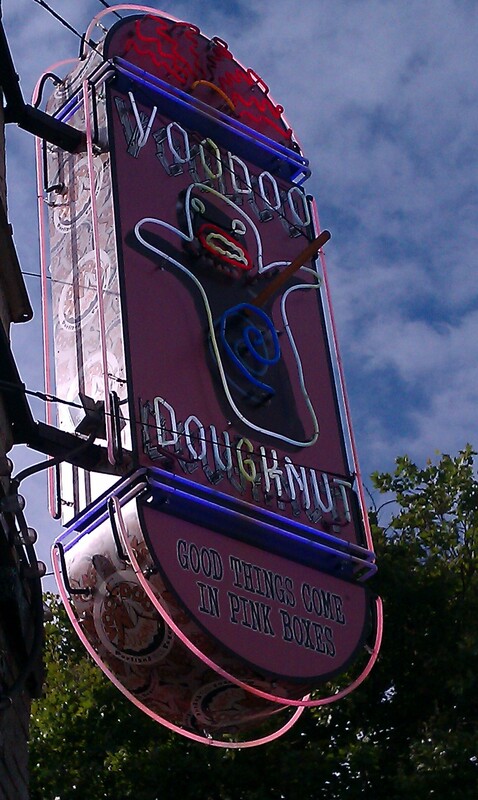 This had to be a good sign and once we finally had gotten to the front door, we were launched into doughnut heaven. Voodoo prides itself as having fans all over the world with its slogan, “The Magic is in the Hole!” In short, their slogan is right. The smell of freshly prepared doughnuts in all shapes and sizes had our palette drooling with expectations that were exceeded after taking our first bite! 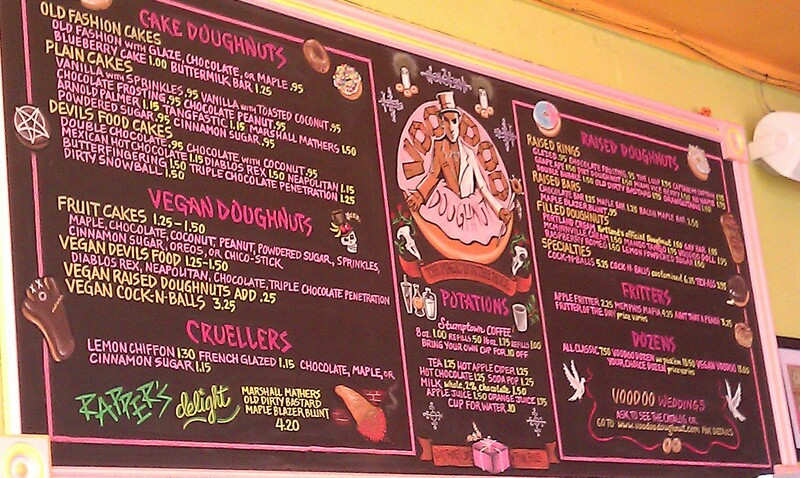 The menu includes a variety of options including cake, vegan, raised, crueller, and fritter doughnuts each with a flavor and style completely unique. Their most popular version is a honey maple glazed doughnut topped with two strips of bacon. Yes, bacon. One bite and the strangeness of this combination will have you looking to fill this odd but delectable new craving until every crumb is finished! Another favorite is the Portland Cream doughnut. This variety is glazed with chocolate and filled with a custard-style cream that encompasses the charm of Portland and puts the Boston Cream to shame. It’s probably a good thing the Portland Cream wasn’t available when Paul Revere made his famous rush through Boston warning, “The British are coming” as one bite of this doughnut and he might have been too sidetracked to finish his good deed, possibly resulting in a failed American Revolution. Seriously though, if you’re looking to get more adventurous we saw a few doughnuts covered with some crazy stuff including Fruit Loops cereal, M&Ms, and another staple of the store in the shape of a man and covered with chocolate glaze and scribbled with various colors of icing, stuffed with a badass strawberry filling that had me asking, “Damn, are you serious? !” These doughnuts are THAT good. The store on the corner of SW 3rd Avenue is where we were treated to some fine eatin’ but fortunately there are three locations including one in the college town of Eugene. 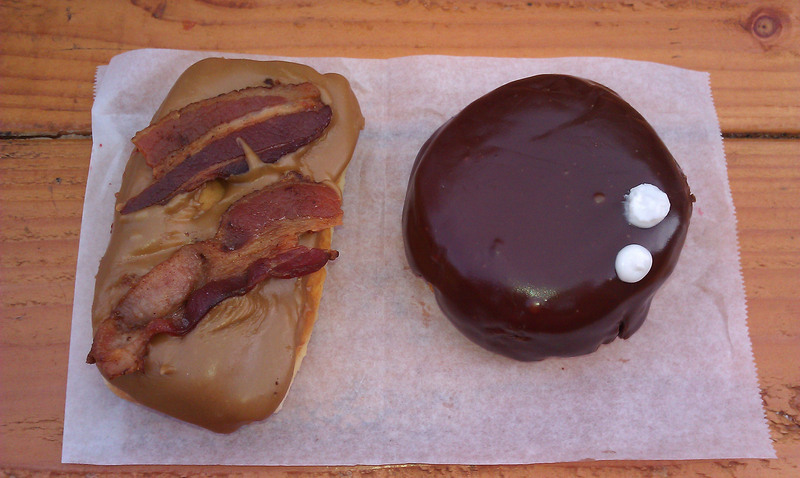 And for those with the late night munchies, Voodoo Doughnuts is open 24 hours a day, 7 days a week (excluding certain holidays) and is a “can’t miss” for those visiting Portland or for those already living there. 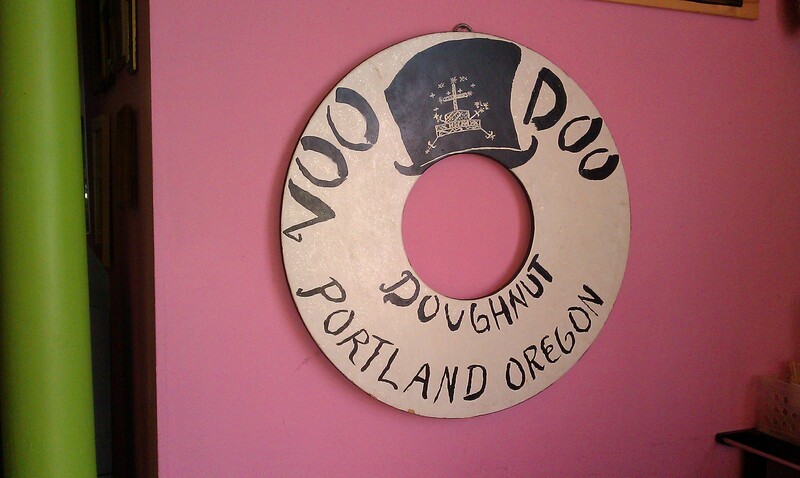 The magic is definitely in the hole and we’re already counting down the days till our next visit to Portland’s landmark doughnut shop: Voodoo Doughnuts. – For more information about Voodoo Doughnuts, including custom orders or other facts about their awesome doughnuts, visit them online at www.voodoodoughnuts.com. * Published by JPFreek Adventure Magazine – The leader in Jeep and adventure enthusiast publications.